Need-based grants, such as Pell Grants, can make educational aspirations a reality for many students who attend Peirce. But recent changes in Pell eligibility guidelines have meant that fewer students are receiving these grants each year, causing some to put their schooling on hold. These changes are occurring because Congress is working to balance the budget for the program. 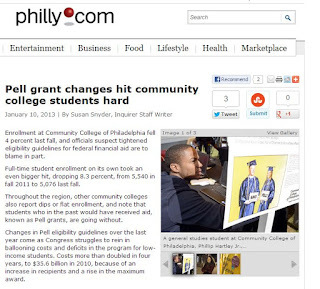 According to an article by Philadelphia Inquirer writer Susan Synder, costs in the Pell Grant program have more than doubled in four years, to $35.6 billion in 2010, because of an increase in recipients and a rise in the maximum award. Susan tapped us to give insights on how changes in Pell Grants are affecting those in the Peirce community. We were happy to share our thoughts, including how these cuts are impacting adult learners. Peirce student Tyease Chesson also shared with Susan the difficulties he faced after the changes were implemented. You can read her article on philly.com.